SMART has a promo that can also be use by TNT subscribers. 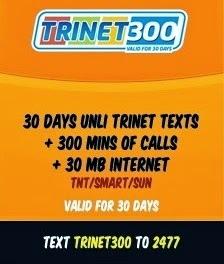 The Unli Trinet300, which offers 1 month of unlimited text to SMART, Talk N Text, or SUN subscribers. It also has 300 minutes of free call, and 30MB of mobile internet. So what are we getting on this promo? Again, a simple math, 30 days divided to P300 is equals to P10 per day, not that expensive, specially when you get to communicate with other networks. By the way, the TRINET promo is also available for SMART and SUN subscribers. With this promo, there will be no more boundaries with friends and families. How to register to Trinet 300? How to call on TRINET: The call instruction will be sent upon registration. Enjoy unlimited text to SMART/SUN/TNT subscribers, as well as free calls, and free mobile internet. All this in one promo package. Multiple promo registration is not allowed. You need to finish the current promo first before availing another. SUN subscribers will have 3 hours of internet, instead of 30 minutes. Promo is valid until October 31, 2013 (Subject to extension). may unli calls and text ba plus text to other networks good for 1 month? How can I register in this promo if I am a smart prepaid subscriber? Please reply with instruction. Thanks!